Cacharel has launched Noa Summer 2012, a new limited edition summer flanker for 1998's Noa. Noa Summer is meant to be "as delicate as the end of a sunny day". The notes for Noa Summer include tangerine, apple, coriander, lemon, peony, frangipani, solar flower, benzoin, musks and coffee. 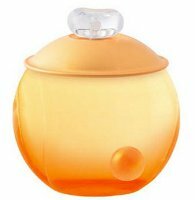 Cacharel Noa Summer 2012 is available in 50 ml Eau de Toilette. Not a fruity floral then? Seems to be a light gourmand or incensy, but with some flowers. The notes are tempting to me. I was attempting irony, but I don’t think I’m very good at it…..
Lol. Sorry, but in the end it was fun. But hard to tell, it might be. Sounds good! Hope to find a bottle. Wouldn’t mind trying this. I wore Noa for a while years ago and loved it then (not so fond of it now, but that’s just me). Sorry to say I can’t remember if I’ve tried it. My access to Cacharel is very limited. What on earth in “solar flower”? Oh, surely a “fantasy” note…in other words, a synthetic that they think has floral + solar (sun-warmed skin) properties.